You probably already have seen him this summer, the touristic train in Javea. 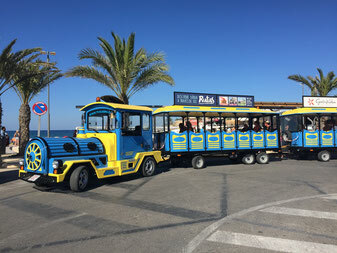 For the little ones or for who likes to take a ride through Javea, you can hop on this train at the end of the Arenal at the large parking or in the port. Enjoy the 7km train ride along the Arenal, La Caleta, El Muntanyar and the port and at each stop you can hop on or off to go for a walk, to eat or to shop. From June till September the train goes daily each 45 min. from 10.00h in the morning till 01.15h at night. Prices: € 4,- for adults and € 3,- for children.